Last month I jetted off on a wonderful holiday to Crete! Arriving at the airport nice and early I had plenty of time for a spend up in duty free and, luckily, enough Boots points for a few last minute makeup purchases before boarding the plane to help me get my holiday glow! I went for Soap & Glory's Hocus Focus flaw-softening illuminator and Glow All Out luminizing powder. I also took my Clinique chubby stick highlighter on holiday with me. Hocus Focus is a wonderful liquid illuminator and looks great mixed in with foundation to add a little glow. Glow All Out is a pink-toned shimmery powder, so I like to use this over my foundation on my cheeks. The Clinique chubby stick is a handy little tool. Rather than spend time faffing with pouring out liquid and dabbing it on my cheeks I can just draw along my cheekbones and browbones and voila! Ooooh hope your holiday was fab! 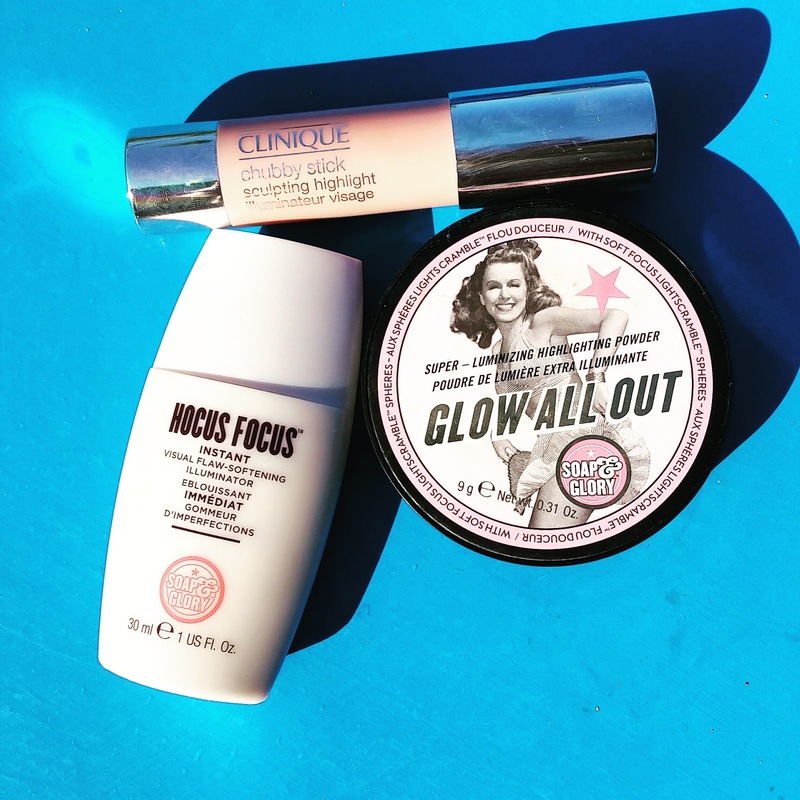 I really want to get my hands on some Soap & GLory products - everyone seems to be raving about them this summer! I keep seein hocus pocus mentioned at the minute. I'm a sucker for a highlighter!